“This has not been a good few months for those of us who believe in a liberal world order committed to peace,” said Margaret MacMillan in the Financial Times. As renegade states defy international norms and the U.S. retreats from its policing role, the global order born after World War II appears to be crumbling, its principles exposed as ephemeral. That makes this an odd moment to come across a book arguing that the past 72 years of relative tranquility sprang from a 63-nation 1928 treaty that outlawed wars of aggression. 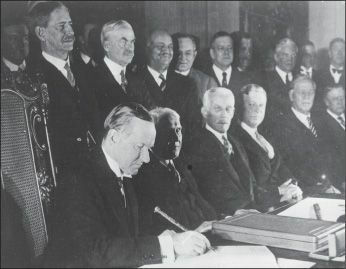 The so-called Kellogg-Briand Pact has long been ridiculed because it did nothing to prevent history’s most devastating conflict. But Yale Law School professors Oona Hathaway and Scott Shapiro are convinced that Kellogg-Briand is underrated, and they make a “fascinating” case that sometimes in geopolitics, ideas really do matter. We too easily forget the brutality of pre– Kellogg-Briand geopolitics, said legal scholar Jacob Katz Cogan on his blog International Law Reporter. For centuries, powerful nations invaded other lands as they pleased, offered rationalizations afterward, and were considered justified in keeping whatever they had conquered. Hathaway and Shapiro call that understanding the Old World Order, and trace its intellectual underpinnings to a book written by 17th-century Dutch scholar Hugo Grotius, the first in a diverse array of thinkers who parade through The Internationalists. The calamity of World War I finally put the old rules on notice. In the conflict’s aftermath, French Foreign Minister Aristide Briand sought a nonaggression pact with the U.S. that Secretary of State Frank Kellogg refashioned into a sweeping ban on war to be signed by every major power. Though World War II soon erupted, the nonaggressors won—then held the aggressors accountable during the Nuremberg Trials. A new order was born.